Use Start/Control Panel/Programs to remove your existing version, if installed. Double click on the msi file to install PadMaker-Midi on your computer. 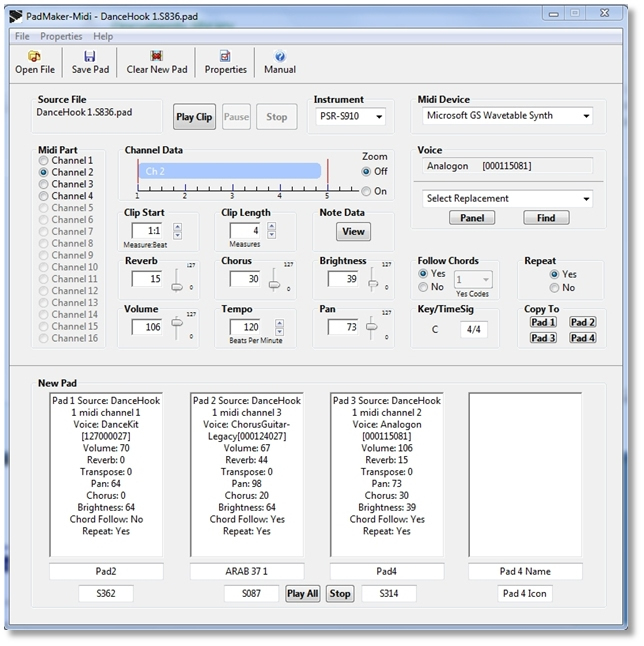 PadMaker-Midi is a tool for creating a Multipad based upon the patterns from one or more midi or pad files. A multipad is a four track midi file. On the instrument, a pad is played by depressing one or more of four pad buttons, which starts the pattern(s). Depending upon settings, each pad can play once or repeat endlessly, and have a fixed pitch or follow chords keyed into the accompaniment section. Since pad patterns are midi patterns, a multipad can be made by copying parts of a midi or pad to a pad track. PadMaker-Midi provides tools for selecting a pattern, copying it to a new multipad, and editing the voice and other characteristics. Create a pad just by selecting an area of a midi or multipad with on screen controls. No typing is required. Audition the pattern on your computer or on your PSR/Tyros keyboard. Edit the Notes, Octave, Voice, Volume, Pan, Reverb, Chorus, Tempo, Brightness, Chord Follow and Repeat parameters for each pad. 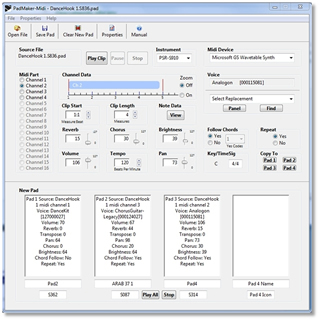 Select instrument voices for PSR 450, 550, 740, 1000, 1100, 1500, 2000, 2100, 3000, 9000, S900, S700, S910, S710, S950, S750, Tyros 1, Tyros 2, Tyros 3, Tyros4, Tyros5, and Genos. Include your own text messages into the pad’s copyright field for acknowledging authorship, providing web links, etc.